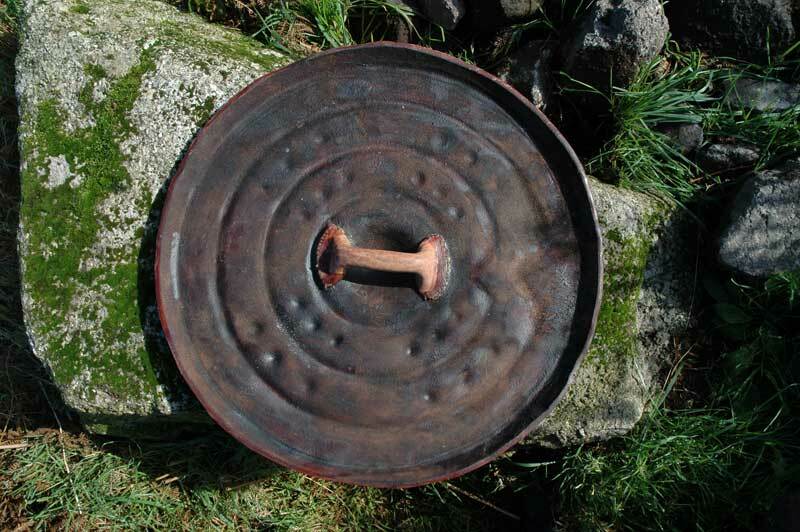 The Clonbrin leather shield is the only surviving leather shield from the Bronze Age' possibly dating from as early as the 13th century BC. It was found in 1908 while cutting peat near Clonbrin, Co. Longford and is now on display in the National Museum of Dublin. Due to its burial in peat its preservation is near perfect , originally being made from one piece of vegetable tanned leather, probably ox hide and bears some marks of combat. For reinforcing a second boss cap was sewn on for added hand protection. 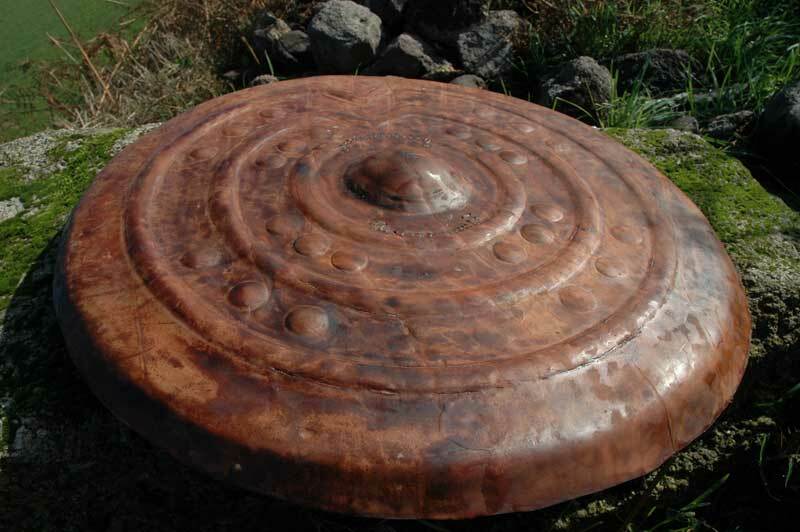 Due to the organic nature no other leather shields have survived, design parallels from the Bronze Age exist on wooden shield formers, Images of shields and surviving bronze shields with similar designs are as far afield as Spain and Southern Scandinavia. 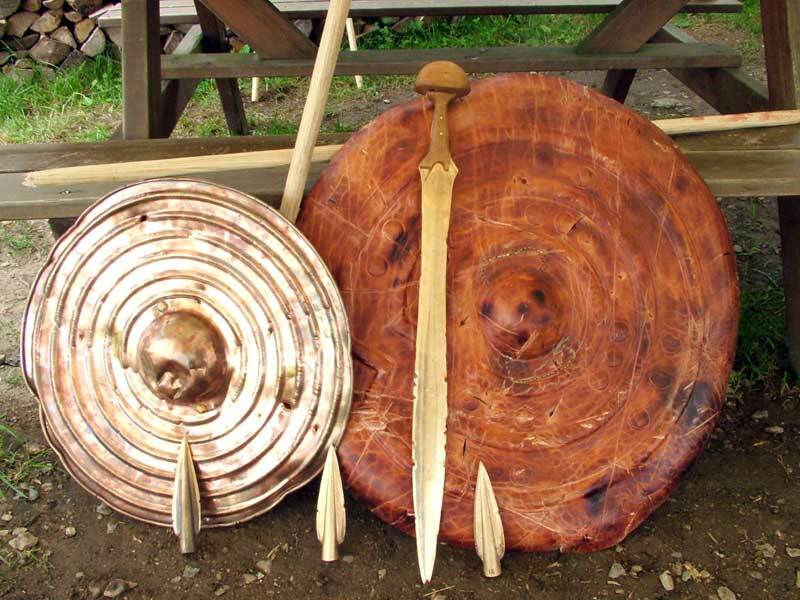 The comparative ease of manufacture of leather shields compared with bronze shields lends weight to the theory that leather shields were probably a common site in the Bronze Age and part of the warrior's panoply, and if so judging by the number of spearheads and swords that survive this era, shield manufacturing must have been wide spread. 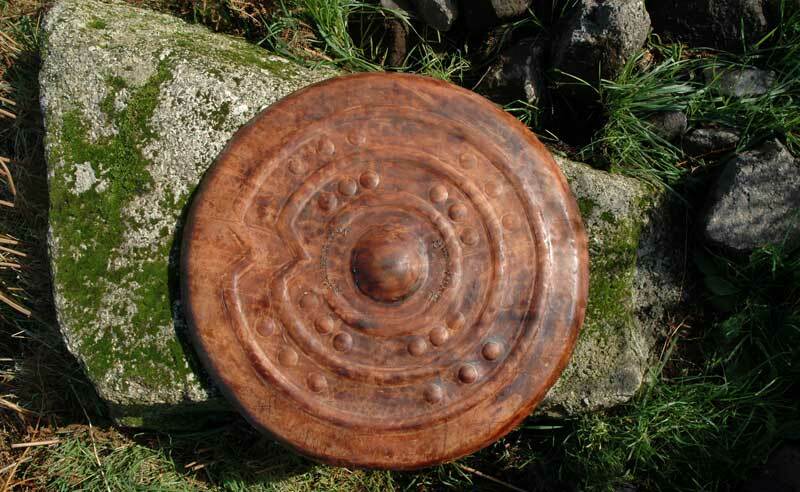 This reconstruction of a Bronze Age shield is made using Bronze Age techniques using top quality vegetable tanned leather hide. 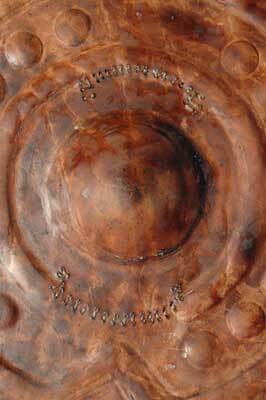 It is shrunk in hot water then beaten into a wooden former then carefully dried and the handle sewn on. The whole shield is then coated in bees' wax. In 2009 an experimental archaeologist tested an identical shield to these against accurate bronze age weapons and it performed better than expected, even after a prolonged attack with spear and sword. The shield was also submerged in the lake for a night and when recovered the next morning showed no signs of water take up or softening. The Clonbrin leather shield after extensive combat testing. Seen here with other reproduction items I made for the experimental archaeology project.